Concepts and directives from the top levels of the Army in recent years acknowledge the need for the entire force to be more expeditionary. In the face of near-peer competitors that can contest forces in every domain of war, Army leaders say units may need to move on an hourly basis. To help get at this operational shift, Raytheon is adapting a Navy system to make aircraft more expeditionary in austere environments. The Joint Precision Approach the Landing System, or JPALS, is a program of record with the Navy that uses GPS signals tied into the aircraft and ship to make calculations for incoming aircraft for precision landing on a moving aircraft carrier. Using internal investment dollars, Raytheon is pitching a repackaged version of JPALS to both the Army and the Air Force for use on land in austere locations. Arconic takes aircraft structures that typically take many components to build and manufactures them as a single piece. Wayne Scott, Raytheon’s senior program manager for JPALS, told C4ISRNET in an interview that he wanted to ”repackage” the technology ”so I could rapidly deploy it to some expeditionary location to support a contingency operation” such as countering a threat or helping an aircraft provide humanitarian relief. With an airfield devoid of proper landing infrastructure, a JPALS system can help an aircraft with its approach and precision landing in a relatively short period of time. The Air Force and the Army are looking at dispersive basing; so rather than a single concentration of aircraft ― which creates an operational security dilemma ― the services are preparing for tomorrow’s war where the military must move smaller units to dispersed bases. Brooks Cleveland, who works with Raytheon on precision landing systems and used to fly F/A-18 jets in the Navy, has experience with JPALS. In an Oct. 4 media briefing, he offered as analogies for dispersive basing the act of island-hopping in the Pacific, or a central nucleus of aircraft in Europe or a desert with the ability to send them into expeditionary environments. This could also be useful in regard to the Korean Peninsula, according to JD Johnson, an executive with Raytheon’s U.S. Army and special operations forces programs. Speaking during the company’s media briefing, he said there’s going to be so much in the air that identifying friend from foe and maintaining control in such a tight, restrictive airspace will be important. Raytheon’s repackaging concept involves a deployable version to have four GPS receivers that are fairly close to the core system along with mounted, ultrahigh-frequency antennas on tactical tripods nearby, Scott said. Those antennas would be for transmition via a secure data link. The system can also be easily moved, as it is sheltered on the back of a Humvee. This design goal is so that the entire system can fit on a C-130 aircraft. Once arriving at its destination, it can be operational in 60 minutes. But, Scott said, it takes about 90 minutes for the GPS sensors to totally sync and provide a high level of precision. This deployable system can simultaneously control up to 50 airplanes out to a 20-nautical-mile radius. Scott said Raytheon is initially pitching this to the Army for use aboard UH-60 helicopters, given the service has such a large fleet of different variants. 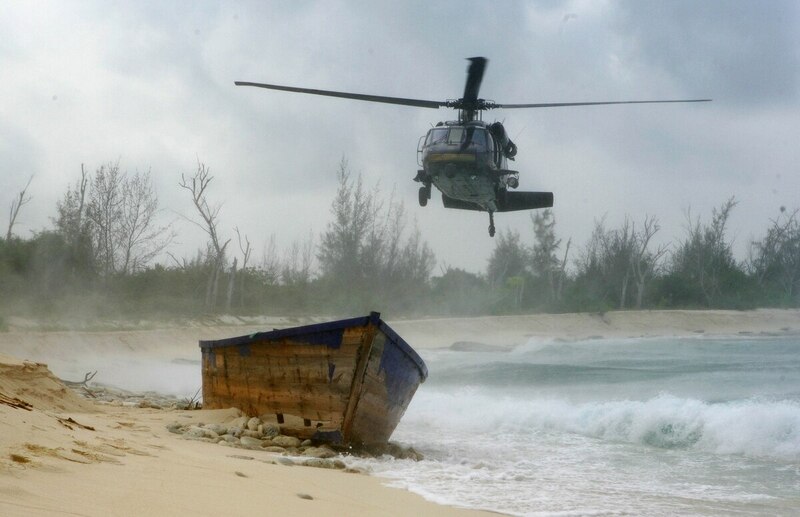 While helicopters don’t fly as fast or require as straight of a landing approach as a fixed-wing aircraft, a precision approach and landing system could still be attractive for helos because because it allows for improved landing in harsh terrain, challenging weather or hostile environments. Cleveland added that one likely wouldn’t consider a precision approach or landing system as an offensive tool, but this allows the Army enter the fight and deploy weapons systems, such as lasers that Raytheon is testing aboard Apache helicopters. Some retrofits aboard aircraft might have to take place to integrate JPALS, Cleveland noted, whereas maintaining the system itself is aircraft agnostic. The four things an aircraft needs for JPALS are a radio that can recognize the JPALS waveform, GPS capability, an inertial identification platform and processing power for the mission computer. In terms of vulnerabilities, Scott noted that JPALS is designed to be jam-resistant with a high level of cybersecurity built into the system. By using the existing ultrahigh-frequency spectrum, which is a lower power than conventional precision-approach radar, the radio frequency signature is reduced. Additionally, given the encrypted data link, an adversary cannot use the transmitted information to determine the location of friendly aircraft.